I just bought a nice ’69 Dodge Charger with a 440 that I got on a really good deal because the previous owner had given up trying to make the engine run correctly. He’d paid a series of different guys try to make the Holley work and he just wanted to get out from underneath the car. The engine is a 440 with headers, an Edelbrock Victor, Jr. intake, and some kind of cam. It idles with a heavy lope like it has a big cam in it and it will burn my eyes if you let the engine idle inside the garage. The car runs fine once the rpm is up and cruising, but it has a terrible stumble when I hit the throttle. The carburetor is a Holley 750 with vacuum secondary. Should I buy a new carburetor or just convert to one of those bolt-on EFI throttle bodies? — J.P.
Jeff Smith: J.P., we can definitely help you. And, you probably you don’t even need a new carburetor. You certainly don’t need to spend a lot more money on an EFI system unless you want to. We just need to run you through eliminating the problem area. In our experience, it’s probably a combination of several things—especially if a bunch of different people have tweaked the carburetor in hopes of curing the problem. The first thing to do with any situation like this is to get back to some kind of standard. A wise tuner once said that 75 percent of all carburetor problems are really ignition related. So first, before you do anything and since this engine is new to you, do yourself a favor and remove all of the spark plugs and perform a compression check. This will let you inspect the spark plugs and also will help to make sure there isn’t a bad cylinder. Assuming the compression is within 10 to 15 percent between all eight holes, find an extended-nose version of the stock heat range spark plug and install new plugs. Next, check the spark plug wires. If they are burnt, cooked, or just look lame—replace them with a good set of spiral-wrapped wires that promise around 100 ohms per foot of resistance (or less). Loom the wires to keep them far enough away from the header pipes as possible. Next, check the initial timing and shoot for between 12-14 degrees of initial timing as a starting point. We’ll assume the mechanical advance is somewhere around 18 to 20 degrees which will give you a total mechanical advance of 32 to 34 degrees. You must check this with the vacuum advance disconnected. Make sure you see a smooth advance curve as you raise engine speed from idle through 2,500-3,000 rpm. Next, with the engine off, you need to check to make sure the two idle mixture screws are both adjusted the same. It’s a common situation to find one side adjusted to 1½ turns out while the opposite idle mixture screw is adjusted to less than a ¼ turn. If they are way off, that’s good. Set them both the same at about 1¼ turns counterclockwise from fully seated. This will be our starting point. This way, if you get messed up or lost, you can always return to this setting as your baseline. We’d like to assume that your 3310 carburetor has not been abused by ‘tuners.’ But we can’t. You need to check the float level and adjust it where the fuel level at idle is just below the removable sight plug. Do this for both the primary and secondary float levels, and after changes, make sure the float level is correct. Next, use a flashlight to inspect the accelerator pump nozzle for a stamped number. It may have been changed to a larger one, which is often the wrong move. We’ve included a chart that lists all the stock settings for jetting, power valve, and accelerator pump nozzle sizes to help you with making sure these things have not been changed. The 0-3310-4 is a 4160 Holley that uses a secondary metering plate with a fixed jet. The metering plate PN 134-21 is equivalent to a 75 jet. 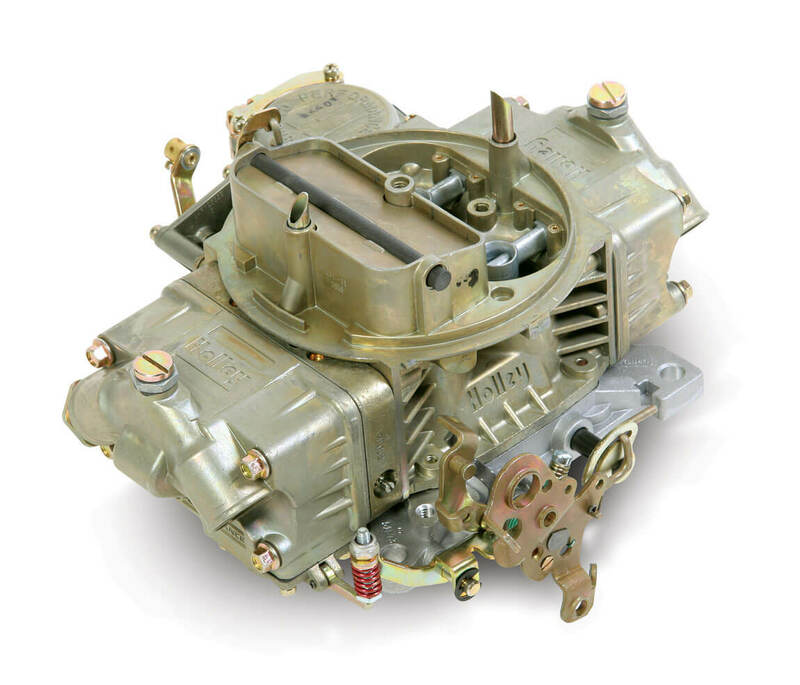 If there are changes, it would be best to return the carburetor back to stock at least to establish a point where we can begin to make some intelligent decisions. Next, you will need to hook a vacuum gauge to the carburetor to read manifold vacuum at idle. Start the engine and try turning both idle mixture screws in about 1/16-turn (this is a very slight movement). Now evaluate that change. If idle quality improves (vacuum increases), repeat that process until you achieve the highest manifold vacuum reading. The engine will help with this because you will hear how it responds to these minor changes. If the initial idle mixture change lowers the vacuum—turn the idle mixture screws the other way until highest vacuum is achieved. Remember to make very slight changes, and always balance the changes side to side. Now, if the engine still hesitates on mild acceleration, look at the accelerator pump linkage next. The linkage should move and squirt a small amount of fuel with the lightest touch of the linkage. If it doesn’t, the linkage needs to be adjusted. We often see where the adjustable spring is set incorrectly. Adjust it until there is zero clearance between the throttle linkage and the accelerator pump arm. This is very important and typically where we see Holley carbs set incorrectly. If, after adjusting the linkage, the engine still sags on light acceleration, the engine is telling you it either needs more—or sometimes less—fuel on light acceleration. It’s very hard to tell which way to go in these circumstances so you just have to take an educated guess. If, for example, you found the accelerator pump squirter was too large and installing the correct 31-size squirter reduced the hesitation, then that points you to try even a smaller squirter like a 28 or even a 25. We’ve seen this work very well. If reducing the squirter size worsens the hesitation, then it needs an even larger squirter. Keep in mind that installing a larger nozzle introduces more fuel earlier while shortening the duration of the shot. Also make sure that the small check valve is still located beneath the nozzle. Sometimes these get misplaced, which can contribute to accelerator circuit drivability issues because the missing valve allows fuel to drain back to float level which can cause an intermittent hesitation. Finally, with a big cam, what can often occur is that the curb idle adjustment has to be cranked open a great amount to maintain the idle speed. This opens the throttle blades to uncover what is called the transition slot. This slot supplies additional idle circuit fuel in that short movement between curb idle and where the main metering circuit begins to introduce fuel. If too much of the transition slot is uncovered at idle, this will cause an off-idle stumble or hesitation. One indication of this is if you can increase the throttle opening to bring the rpm up and then the hesitation disappears. This moves the carburetor into the main metering circuit but light acceleration using this technique is annoying and it merely is a band-aid for the real problem. To bring the curb idle back to the ideal spot of uncovering about 0.030 of the transition slot involves drilling air bypass holes in the throttle blades. This is an involved process that is too long to discuss here. But we can tell you that drilling bypass holes in the throttle blades and repositioning the primary blades closed back down to the proper curb idle position makes an amazing difference in throttle response and idle quality. It’s definitely worth the effort to make this happen. Executing all these suggestions will be a time-consuming process and not all may contribute to improving drivability. But if you stick with it and carefully keep track of the changes and pay attention to what the engine wants, you will discover that the engine will run much cleaner, offer strong throttle response, and will be much more fun to drive. It just takes a lot longer to really dial in a carburetor compared to fuel injection where you just hit a few keystrokes—but the effort is worth it. Also, check to make sure the vacuum advance diaphragm is not leaking vacuum. If it is, it can cause all sorts of problems. Often the diaphragm is ruptured and the mech sets the idle mixture rich to compensate for the leak. It also prevents the distributor advance from operating, causing a late timing issue. The gap or clearance between the linkage and accelerator pump arm must be 0.012 – 0.015. And that is measured at wide open throttle using a feeler gauge. Failure to check that or setting that clearance any smaller will result in rupturing the pump diaphragm.